Some married couples sit around in the evenings, discussing the mortgage and who's picking the kids up from school tomorrow. Fabio and I have been updating our Zombie Apocalypse Survival Plan. I can't tell you what it is, because frankly we don't need anyone stealing our awesome Plan and then having to compete with them for resources, so you'll have to think of your own Plan, then tell it to me, and I'll see if ours is better. Fabio had to have a couple of shots at it. One of his ideas was to move us out into the wheatbelt of WA, so we could see anything coming -- but I pointed out that zombies come at NIGHT so you CAN'T see them, and you're better off in a place with access to WATER and SUPPLIES, and told him to Plan better or I'd have to remove him from the Planning Committee. So then he came up with a Really Good Plan, part of which involves stealing a 60 foot motorboat. I asked him if he knew how to drive one, and he said "Enough." I said, "Well, it better be more than 'enough', cos I can't swim very well." "You can't RUN very well, either," he said, "so we'll take our chances with the yacht." My amendment to his Plan is to grab a bunch of people from our karate class. You should SEE some of them do a roundhouse kick! Oh my goodness - something else to lose sleep over. This is going on the 'do we have to?' list with tax and insurance. 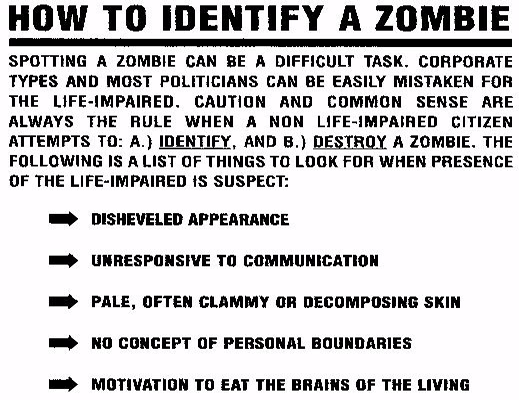 The key is a willingness to sacrifice your slow moving friends and relatives to distract the zombies while you run. And also to have this awesome zombie proof house. I LOVE that house. And my daughter wants one too. I have a friend that I love dearly, and I've already told him that if zombies chase us, I'm gonna trip him over. He just laughed. I don't think he thought I was serious. I don't have any plans except to lock myself in and them out. I wonder about the man in the flat upstairs sometimes. Rarely seen, always dishevelled, grey of skin, bloodshot eyes. What do you think? Zombie? Umm yeah, I'd keep the chainsaw handy. I saw Zombie Bill Murray in the supermarket one day, but because he was in the fruit and veg section I didn't worry about him too much. If you've seen Zombieland (GREAT documentary) you'll know just what I'm talking about. 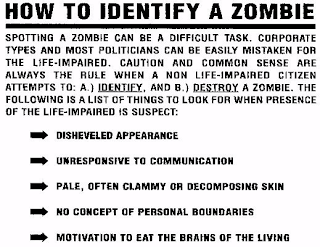 Everyone needs a Zombie plan.